A device attached to a metered-dose inhaler that aids delivery of inhaled medications. on a metered dose inhaler, a chamber between the inhaler canister and the patient's mouth where droplets of medication can slow down and evaporate so that there is less direct impact on the oropharynx, with more medication delivered to the lower respiratory tract instead of being lost in the mouth. This is especially helpful for children. See also metered dose inhaler. An extension device for a metered-dose inhaler; it is designed to eliminate the need for hand-breath coordination and to reduce the deposition of large aerosol particles in the upper airway. A specially shaped container that improves the delivery of inhaled aerosols, such as beta2 agonists, steroids, and other antiasthmatic drugs, to the bronchi and lungs. Spacers form a channel between metered dose inhalers and the mouth through which medicated mists can be inhaled. 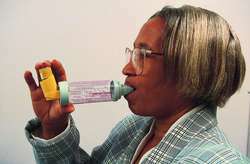 They improve the performance of antiasthmatic drugs because without them, a large quantity of inhaled medications end up in the mouth, on the palate, on the buccal mucosa, or on the tongue and fail to reach their intended target in the lower airways. Spacers improve the delivery of inhaled drugs to any patient who cannot coordinate the use of metered dose inhalers, and in all patients who used inhaled steroids. They are also recommended for young children, e.g. under the age of 6. Figure 6 illustrates the riveting process of the spacer bolt. However, number and node length of spacers and total spacer length significantly increased in C-D class from forest canopy to large gap, but there was no significant effects in other classes, as a interactive effects of canopy condition and ramet class on spacer traits (p < 0. Nonasbestos ring liner (wet) used as spacer when shellac is used for custom tray fabrication. This study demonstrate that correct use of MDI with spacer and without spacer produce same clinical efficacy. My child has a big spacer called a Volumatic with a plastic mask--how do I use it? This systematic review and meta-analysis pooled the results of RCTs comparing spacers to nebulizers for administering beta-agonists during acute, non-life-threatening asthma exacerbations. Potential licensees interested in obtaining more information about the Foot Spacer and discussing licensing opportunities with respect to the product can contact the Manufacturer Response Department of Innovation Direct[TM] at (877) 991-0909 ext. Fortify I integrated corpectomy spacers (Fortify I and Fortify I-R) are vertebral body replacement devices indicated by the U. FOLLOW these top tips on how to use tile spacers effectively. Use a flat wood chisel first to remove the small block spacers - once the first couple are out, the others should be quick to remove. During the drilling of a deepwater oil well, crews set and cement in place a series of concentric casings or spacers that stop leaks and prevent the collapse of the geological formation into the well. Materials (one arch section): (4) 1/2 x 2" by 14' laminae (2) 2 x 4 x 12 end spacers (7) 2 x 4 x 4 intermediate spacers (22) 3-1/2" galvanized screws (18) 2" sheet-rock screws Jar with yellow carpenter's glue (2) 2 x 4 dummy spacers, length = spacer width + 2 laminae thicknesses Procedure 1.